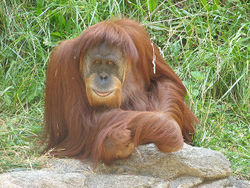 Orangutans have long, red or orange fur. They are around four to five feet tall with an arm span of about seven feet from fingertip to fingertip. Orangutans have long, powerful arms and grasping hands and feet that enable them to be more efficient while in the trees. They can weigh up to 200 pounds. Male orangutans can be either flanged or unflanged. Flanged males have prominent cheek pads called flanges and a throat sac to make loud noises called long calls. Unflanged males look like adult females. It is possible for an unflanged male to become flanged. Sumatran orangutans have longer facial hair than Bornean orangutans. Female orangutans have a reproduction system that is very similar to that of a human. They menstruate with a cycle that lasts around 30 days. Orangutans reproduce sexually. The female has a gestation period of about nine months. They give birth to a single infant about every eight years. This allows the mother to give her child all the attention it needs. Young orangutans stay close to their mothers for 6 or 7 years after birth until they are developed and able to care for themselves. When born, an orangutan weighs around 3-5 pounds. There are three stages of development: infant, juvenile, and adolescent. A female reaches adulthood when her first infant is born. This happens at around 14-16 years. A male reaches adulthood when his laryngeal throat pouch, cheek pads, and long call emerge which usually happens when they are 18-20 years, but it is possible for this to occur earlier in life. Distribution map of the Bornean and Sumatran orangutans. An Orangutan imitating a boy in Borneo. ↑ Pongo Wikispecies. Web. Last updated 4 October 2014. Unknown Author. ↑ 2.0 2.1 2.2 2.3 Orangutan World Wildlife Fund. Web. Accessed 14 December 2014. Unknown Author. ↑ 3.0 3.1 3.2 3.3 Orangutan National Geographic. Web. Accessed 11 January 2015. Unknown Author. 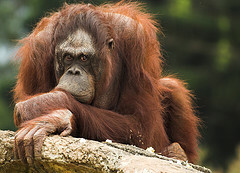 ↑ Fun Facts About Orangutans Orangutans!. Web. Last Accessed 11 January 2015. Unknown Author. ↑ Ahrens, Justin R. Reproduction The Orangutan. Web. Last Updated April 2008. ↑ Gray, Irina. Orangutans' Intelligence Tropical-Rainforest-Animals.com. Web. Last updated February 2009. This page was last modified on 29 October 2015, at 19:24.